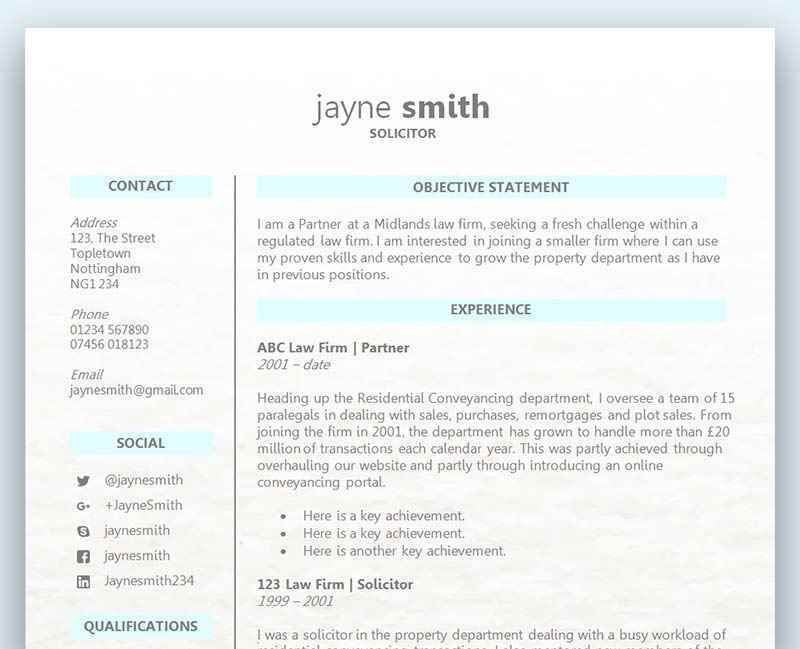 This free one-page CV template in Microsoft Word is ideal for Solicitors or other types of lawyers looking for a clean layout that will catch the attention of prospective employers. The CV template uses the gorgeous Jenna Sue font, combined with crisp Open Sans Light, to present your information in an attractive format. The layout includes space for a photo and two quotes which might be from references or (with permission or anonymised) from clients. As the CV template is built in tables, it is fairly easy to expand onto a further page if a more extended CV layout is required. Free Microsoft Word Solicitor CV template	Overall rating:	5	out of 5 based on 6	reviews. The design of this CV template has a slightly informal feel - so it's great for private client, family or other client-facing roles where a friendly and approachable outlook are essential elements of the job. Be sure to install the fonts before you start editing - both are free, with links below. You'll also find instructions in the CV template for creating a rounded photo. To change the picture in the template (for example, to insert a headshot) simply right click and choose ‘Change Picture’. If you want to stand any chance of making it to the interview stage your CV has to be completely free of mistakes. The quality of the CV in today’s competitive job market is at an all time high; with employers not just looking for the right skills and qualifications, but also an outstanding and error free CV. So let’s start with probably the most annoying error from the employer’s perspective, and also the most common. Making a simple spelling error is quite easy to do, and when we rely so much on our word processing software it’s understandable why it happens from time to time. After completing your CV you should always go over it numerous times to ensure there are no errors. Grammatical errors may be a little trickier to spot, so it’s a good idea to ask someone else to look over it for you. Always have your CV proofread by someone else rather than trust your own judgement, as they can not only check for small errors but also provide you with valuable feedback on the overall content of your CV, presentation, layout, choice of font, and anything else they can help you with. Try to find someone who has extensive experience in reading CVs, hiring and conducting interviews. Someone with this kind of knowledge will always be able to offer constructive feedback which could tip the odds in your favour. Most people apply for more than one job at a time to give themselves a better chance of gaining an interview. Naturally it would make sense to send the same CV off each time wouldn’t it? Unfortunately not, and if you send the same generic CV off to numerous different employers you are very likely not to hear anything from them. But why is that, and what’s wrong with a generic CV? There are two main reasons why using the same CV will hinder your chances. Firstly, the hiring manager wants to be able to quickly skim through each CV and identify the right skills and qualifications. With so many to read through they just don’t have the time to read every single word, and prefer to narrow the search down quickly to read in more depth at a later time. Although you may be applying for the same job title to different companies, there will still always be differences in what they expect and you can see this from the job advert. Of course there will be similarities, but that doesn’t mean to say that the same CV will work for every employer. Secondly, the employer wants to see that you are passionate and determined to get the job, and a generic CV just can’t get you that reaction. Compare your CV to others that have specifically tailored their application with the job and the company in mind, ensuring they’ve covered every single skill and qualifications, used the same keywords as the advert, and written a CV that’s in line with the culture of the company. This candidate has clearly done their research – and it will show! A standard CV should only be two pages long. One page is of course too short and would essentially be classed as a résumé, whilst three pages could send the reader to sleep. There are a few exceptions to this rule with certain professions needing the extra space, but for most just the two pages is more than enough. If you’re struggling to keep everything to two pages it will mean you are trying to put down too much irrelevant information. Not only should your CV be tailored to the role, it should also only provide relevant information. This doesn’t mean to say you remove almost all of your work history if it doesn’t match the role, but instead you should always look to keep irrelevant information down to a minimum. You don’t have to list every single job you’ve had since you were 17 if you’re now 45. With such an extensive amount of work history some of your early roles may not even need to be included if they are irrelevant. You also don’t have to list every single tasks and responsibility if it isn’t of any help to the employer, and only look to list the most important tasks.